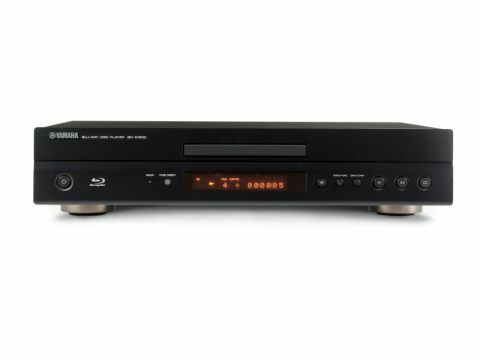 Yamaha was a latecomer to the Blu-ray party, having launched the Profile 1.1 BD-S2900 in 2008 with little fanfare and to mixed reviews. But the beloved hi-fi brand is hoping to make more of a splash with its latest player, the Yamaha BD-S1900. Designed to partner Yamaha's extensive range of AV amps, the BD-S1900 features many of the company's distinctive design traits – moody black finish, orange LED display and sharp, angular lines. Its sturdy construction is further proof that this is a deck for Blu-ray buffs. On the back you get a healthy array of sockets, most notable of which is the set of 7.1-channel analogue audio outputs. Despite the fact that most AV receivers these days can handle HD audio streams and PCM via HDMI, some users still prefer to let their player do the decoding. They're backed up by a separate set of analogue outputs for listening to downmixed soundtracks and CDs. The RS-232 and remote in/out sockets hint at the deck's custom install potential, while an Ethernet port provides web access. Disappointingly, there's no built-in Wi-Fi , while several rivals provide this for a lot less money. From a features perspective, BD Live and BonusView support is as good as it gets. There's no network streaming, YouTube playback or any of the other goodies that make the latest decks from Panasonic, LG and Sony so appealing. The only supported digital media formats are JPEG and AVCHD, and these can only be played from CD and DVD respectively, as the USB port on the rear is only intended for BD Live storage and firmware updates. This is another sticking point in itself, because at this price you'd expect built-in storage for web downloads, and the need to plug in a USB flash drive is not only inconvenient, but also adds extra cost. The lack of extra features isn't likely to bother owners of Yamaha amps who are looking for a matching player that does all the basics (1080/24p output, Dolby True HD/DTS HD Master Audio decoding and 1080p DVD upscaling), but others can find a lot more for their money elsewhere. The BD-S1900 takes a while to creak into life, but if you activate the Quick Start standby mode you're up and running in seconds. Hit the set-up button, however, and you get the same garish menu screen seen on Sharp's Blu-ray players, which features four large icons in the centre. One of these is Settings, and we like the way each option is described in plain English. Another section of the main menu offers easy access to JPEG photos. Navigation is aided by a very helpfully laid out remote that's uncluttered and places the menu buttons in exactly the right spot and the different sections are separated using white, grey and black keys.The only minor annoyance is the lack of a backlight. Impatient movie fans beware – the Yamaha loads up discs with all the urgency of a sedated snail. With Spider-Man 3 in the tray, it took 80 seconds after pressing Close to get to its first moving video, while Terminator Salvation took an epic one minute and 55 seconds. The Silicon Optix test disc also throws up one or two problems, revealing some less-than-assured processing. These flaws don't cause a huge problem with movie playback, though. Terminator Salvation still looks terrific, presented with punchy, cinematic depth and packed with immaculately rendered detail. Check out the harsh, dusty desert plains or close-ups of Christian Bale's face and you'll see all the texture, light and shade delivered with the clarity only Blu-ray can bring. It doesn't eke out the very last scintilla of detail in the same way as the Panasonic BD85 or some high-end players we've tested, but it's still highly impressive. This is not a film bursting with bright colours, something that the Yamaha understands explicitly – its deft, nuanced handling of the palette and the intricate shadow work is highly impressive. It also does a fairly good job with DVDs, which look clean and detailed. We fed in Kingdom of Heaven and the shots of armies are reproduced with reasonable sharpness. Colours are also convincing, although the image is a tad smudgy in places and there are one or two twitchy edges. The Yamaha's sound quality is superb across the board. Rigged up using the analogue outputs, the deck's handling of Terminator Salvation's DTS HD Master Audio track is an absolute riot. Effects pummel you from every angle, the clarity of dialogue is pleasing and there's a healthy dose of bass. Similar praise goes to its music handling capabilities: we fed it a wide range of genres on CD and it delivered each one with admirable detail and balance. Of course, you do need to have a good sound system to do it justice. When you consider the barren feature list alongside the lofty price tag, it's clear that the BD-S1900 does not represent good value for money. There are players offering more features, faster disc loading, more extensive media support and better operating systems for less than half the price of this deck. But in its favour, the BD-S1900's build quality is superb and its picture and sound performance is generally up to scratch, although it's by no means good enough to justify the extra outlay.